Productivity is one of the most important factors in your business. Smart Factoree™ connects directly to your equipment to provide you the tools you need to analyze, understand and increase your productivity. By integrating Smart Factoree™ into your process, we have seen up to 20% production improvements. Smart Factoree™ offers the opportunity to see the downtime of your factory, the reasons why your equipment stopped and how long and how often it occurred (anytime). With the data the system provides, it’s easy to identify the factors responsible for your loss of productivity. 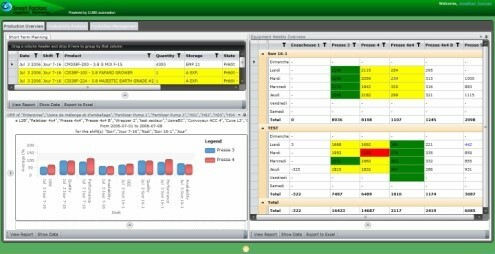 The Productivity Analysis module measures the efficiency of your plant, your production lines and your equipment. This feature gives you a quick overview of your efficiency (OEE). This measure is based on three criteria: availability, performance and quality of the product. The module provides information about how to increase your productivity. For example if the quality rate is low, it could be caused by a problem with equipment that is damaging your product. Smart FactoreeTM ensures that important decisions are taken by analysis of data and facts. It can also give detailed information to increase your productivity, our Equipment Activity feature allows you to display the production rate of your equipment minute by minute or make a detail monitoring of key process indicators (KPI).